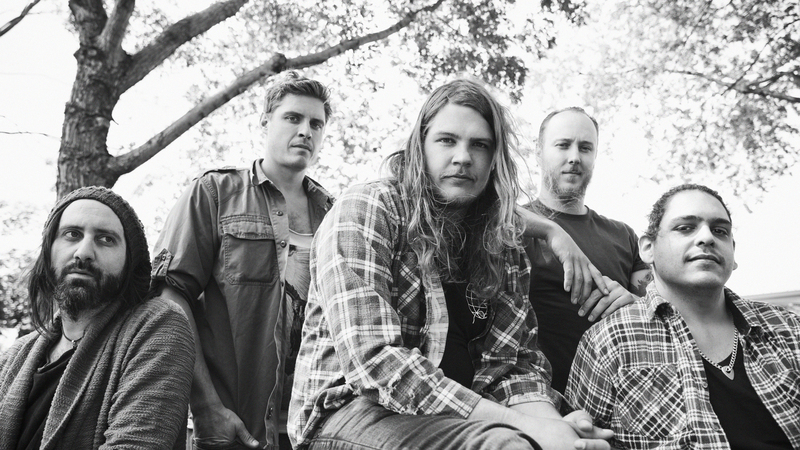 The Glorious Sons are devoted to rock’n’roll, in the purest sense of the word. Their 2014 debut album, The Union, was a triumph of bluesy melodic rock, filled with rugged, southern style anthems and catchy-as-hell hooks. The record was a success, and earned the quintet a frequent spot on Canadian Rock Radio. After consistent touring, writing, and recording, the guys are back with their second full-length, Young Beauties and Fools. This time around, the Ontario natives have paired their signature whiskey-soaked sound with introspective lyrics that explore the peaks and valleys of being a young adult, alcoholism, and growing up. Largely centered on the experiences of songwriter Brett Emmons, the album packs in rough-around-the-edges bangers and scrappy love songs all in under 32 minutes. "Everything is Alright", a standout on the record, showcases the album’s rustic sound and emotive power. Emmons sings, "I set out on a dream that I couldn't understand / It made me happy, sad, love, lonely and I don't know what I had." On Monday, December 11, The Glorious Sons released their new music video for the single. Set against a white background, the video shows tomatoes flying at Brett Emmons before slow-mo shots of some tar-and-feathering actions. Of the video, he told us, "It’s nice getting your hands dirty once in a while. The video was a quite enjoyable and painless experience, other than getting smashed in the face with tomatoes. Thank you to our director Colin and his crew for the outstanding work and fun day." What the guys are up to now? After wrapping up the first leg of their fall tour on their home turf, The Glorious Sons announced that a UK run is in the works for March, where they will making stops in London, Manchester, and Glasgow. We caught up with Sons to ask them about life on the road, writing an autobiographical record, and the difference between touring the US versus Canada. Check out the full interview below, then make sure to track the five-piece on Bandsintown to stay up-to-date with all their touring news! What was the creative process like for Young Beauties and Fools? What was the biggest difference you saw in the studio this time around since recording 2014’s The Union? I've never been very good at answering this question—there is no one way to describe it. First off, I would say it was mentally taxing. We had a very foggy vision of what we wanted to do, but couldn't quite describe it, or achieve it ourselves. It wasn't until we met Fred, Tom, and Ryan (production team), that things started really revealing themselves. It was different this time, because a lot of the songs were there, but were from my voice notes and were quite folky in nature. We had over a hundred to choose from, and it was more about finding which ones matched the vision and caused the most excitement. When we wrote The Union, it was more of a band room thing— we had spent countless hours rehearsing and refining the songs with The Trews' John Angus (producer of The Union) before we went into the studio. This time it was built in the room, on the fly. When we finally found it though, it all went really fast, and the songs just aligned. But there was a few times in the last three years that I woke up asking myself, "Is this ever gonna happen?" To boot, mixing this album was an absolute nightmare, it took way longer than recording it. It was kind of war within ourselves about choosing. Where do we depart? Where do we stay the same? I mean we really wanted a change sonically, we wanted to make rock and roll that sounded like 2017. But we didn't want to lose that edge, that dirt, that makes us who we are as musicians. In the end, I think we were able to sift through and navigate the weeds pretty well. And I'm quite proud to come out somewhat sane on the other side. Is there one song in particular that means the most to you? I would say "Sawed off Shotgun". I just believe that it's a song that people need to hear nowadays. I won't get into it any further than that. But the protagonist in that song is speaking the truth, and it's about right now, and right here. The things that affect all of us, whether we're twenty or sixty years old. Give us the backstory around the LP’s cover art—paint the scene. It's a picture of my girlfriend and her little sister, from Norther Ontario when they were younger. She had posted it on her Instagram awhile back, and I just thought "That's it, that's what I want to say". There's not huge meaning in it. But I find it so fascinating, how innocent and free from ourselves we truly are when we're young, and I thought that picture spoke it. How have audiences been responding to the new songs so far? Is there one that’s been the most fun to play live so far? The audiences have been amazing. There's some nights I swear I wouldn't even have to sing. I can't really pick one that's been the best, because with a larger catalogue and the response that we've seen since releasing last month, each song has provided a unique moment to the set. I truly don't think it could get better. What defines a successful performance for you? High energy from both the band and the crowd. I want to see people smiling and singing. I want to take them up for a while, then bring them down. A live set should be journey. And as a frontman, you should conduct that journey—it should spontaneous, beautiful, dirty, weird, sweaty, sad, happy, and mad. And most of all it should be fun, for both the band and the crowd. What are some staples that you can’t leave home without in terms of clothing and/or personal items? There isn't much in my life, as far as things, that I can't leave behind. One would be cigarettes, Canadian cigarettes to be exact. I feel the American and European brands leave a dusty feeling in your throat and chest, and cause me both physical and mental anguish in terms of singing. Other than that, maybe a good book. Except Ulysses by James Joyce—I haven't read since trying to read . It's just so goddamn confusing. Do you prefer playing in smaller bars or bigger concert halls? All-time favorite venue to perform in? It's hard to say. They both have there positives and negatives. There's nothing quite like being in a tiny club where you can feel the heat and smell the sweat of the crowd and the band. But it's easier to take people to church in a bigger venue where there's more room to move and a larger audience. What does the ten minutes leading up to your show look like? Any rituals? No rituals, business as usual for us guys. We used to sing the bridge from "Rosalita", but it kind of wore off. Nowadays, we have a few drinks, kick out the hangers, and get loose. It does change night to night, depending on which city you're in and who's around. But for the most part we do our celebrating and socializing after the show. How does the band pass the time on the road in-between shows? It's tough to say really. I see all these other bands Instagram accounts and they always seem to be doing something more interesting than us. For the most part, the band as a whole likes two things: good dinners and good drinks. We like to go out to pubs, play darts, maybe hit an afterparty after the show. Other than that, we do a lot of talking and laughing. What’s on the horizon for The Glorious Sons? The immediate future looks quite promising. We are headed over to the UK for the first time. We have some gigs in the states that are selling more than three tickets a night, and we're having fun. I think the band's really been rejuvenated since releasing the album, and it feels good to finally grasp some momentum again. Other than that, we're gonna do what we've always done: write music, play music, and have fun.